This is the sign off Hwy 1943. Note: This log covers both the Turkey Creek Trail (from Hwy 1943 to Gore Store Road) and the Pitcher Plant Trail. 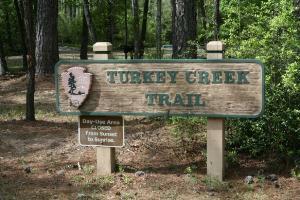 The Turkey Creek trail is a long, winding, primitive, linear trail that runs parallel to and along Turkey Creek. It reminded me of the Lone Star Hiking Trail, only the trees were not blazed. Along the way, you can take a fork to the Pitcher Plant Trail (which can be hiked separately if you access the trail from Pin Oak Road). Whether you hike the Pitcher Plant Trail separately or in conjunction with the Turkey Creek Trail, I highly recommend you hike the Pitcher Plant Trail. They are really cool, alien-looking plants, and the Pitcher Plant trail will take you to an area where there are gazillions of them. The Turkey Creek Trail is a good, flat distance hike, but the trail was not very well-maintained. There were several fallen trees blocking the trail and a few widowmakers leaning over the trail. The signage is OK, but not great. For example, I saw mile marker posts, but only the 4, 6, 7, and 8 mile posts. The others were missing or not visible. Also, sometimes the trail joins and proceeds along a utility right of way path or dirt road and there are signs pointing to where the trail branches off, but at other times there are no signs. This causes a little confusion and increases the chance of making a wrong turn. You can camp for free in the Big Thicket, but you have to get a Backcountry Use Permit at the Visitors Center. Also, be advised that camping is primitive. There are no campgrounds, campsites, water or electrical hookups. You just pitch your tent under the stars. The Turkey Creek Trail took me two days to complete. Consequently, this log will be followed by my log of the southern portion of Turkey Creek Trail (from Gore Store Road to the Kirby Nature Trail) and Sandhill Loop.